A Bridge in a mikrotik Router is an Ethernet-like network such as Ethernet, access points and VLAN that can be connected together using MAC bridges. Bridges are similar to repeaters and hubs in that they broadcast data to every node. However, bridges maintain the media access control (MAC) address table as soon as they discover new segments, so subsequent transmissions are sent to only to the desired recipient. The bridge functionality allows the interconnection of hosts connected to separate LANs to inter-communicate as if they were attached to a single LAN. Read more about bridges here. Because bridges are transparent, they do not appear in traceroute list, and no utility can make a distinction between a host working in one LAN and a host working in another LAN if these LANs are bridged. Having seen a brief introduction to bridges and it functions, in this tutorial am going to show you how you can create a network bridge. So that you’re Ethernet acess points and Vlans can be connected together via Mac Bridge. In summary you will understand that a bridge allows two separate networks to act as one. Okay to create a bridge and assign port to those bridges, we have to go over to our router and the login via winbox. Please follow my steps below to create a successful bridge. 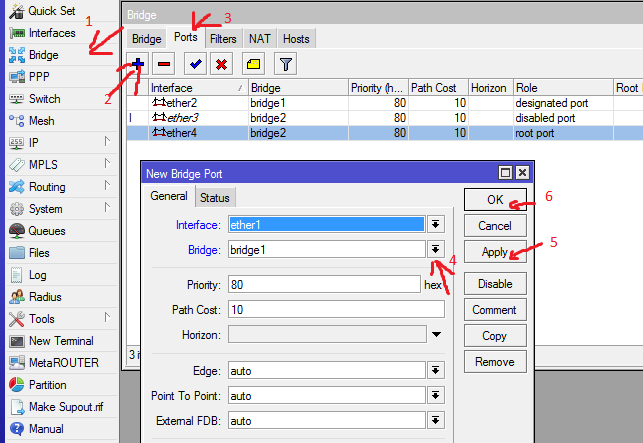 Step 1 on the router interface menu click on bridge. Step 2 add a bridge by clicking on the plus sign. Step 3 Name your bridge and sometimes add a comment if you like, click apply and ok. Step 4 in this step the main thing here is to assign port to the bridge you have created. To do this we will click on porttag on top of the menu, then double click bridge we have created ether1 , ether2, depending on the name you give to the bridge and then put them in a the appropriate port by using a drop down arrow. You don’t need to change most of the default configuration hence they will work perfectly on your network. Click on apply and ok. After this time you will notice that your ether1 is in the bridge port you have assigned to it and can now have access to resources in that domain. You will achieve some more benefits of having one DHCP running on your etther1 and also one IP. To view the configuration click on interface to see the status of the bridges port. ← Configuring Queues On Mikrotik Routers.